I’m so excited to announce the release of Operation Back-to-School, the fourth and final novella in my Operation Romance series. It came out on Tuesday as part of the Falling for You box set. I hope many of you got the set and are happily working your way through it already. 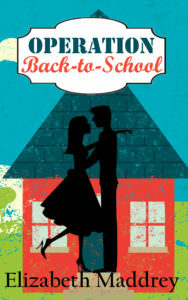 But, in case you didn’t, you can get Operation Back-to-School, along with five other wonderful novellas, for just $0.99. In Operation Back-to-School, we meet Shannon Cross, an executive assistant at Intelligence Associates, Inc. If you read the first book in the Operation Romance series, Operation Mistletoe, you got a hint of Shannon when Tori went to IA to do some research on the company. Shannon was the friend Angel mentioned who was working from home after the loss of her husband. Well, now Shannon’s two girls are in school and it’s time for Shannon to return to work. And that’s what kicks off our story. He wants to be more than her daughter’s teacher. Fraiser Campbell has finally landed his dream job: teaching kindergarten. Falling in love with the mother of one of his students isn’t in the lesson plan. Now that both her girls are in school, Shannon Cross is ready to get back to the office. As for her personal life, she’s finally coming to terms with her husband’s death three years ago and adjusting to life as a single mom. At back-to-school night, neither Shannon nor Fraiser can deny their attraction, and he’s determined to see where things lead. But learning to live without her husband is a long way from being ready to replace him. How can she fall for Fraiser without feeling that she’s betraying the first man she loved? When Mrs. Curtis dismissed them, Shannon tucked a note in Lizzie’s desk for her to find in the morning, and stood. Two minutes ‘til nine. Her heart sank. Mr. Campbell was probably already gone. But she had to try. If he asked Jillian why her mom hadn’t come…the tears weren’t worth contemplating. Shannon zipped down the hallway and let out the breath she’d been holding when she saw lights still on in the classroom. She paused outside the door. Carol stiffened, scowled at Mr. Campbell, and stalked out of the room. “Oh. I’m so sorry.” His face was red, bordering on purple. Shannon almost smiled. No one would ever say he could blush unobtrusively. “Yeah. My dad is six weeks younger than my mom. People often ask if he’s her son. She’s not as amused by it as he is.” Fraiser tucked his hands into the pockets of his khakis. 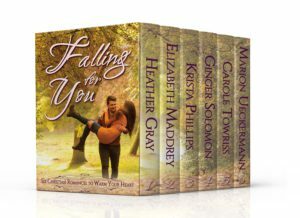 I hope that piques your interest some and that you’ll check out the Falling for You box! Hi Elizabeth! Happily working my way through the set and reading Operation Back to School. So fitting since school started in Michigan last week. The novella is relatable, because I am a retired English and Creative Writing teacher and my daughter-in-law is a elementary school principal. Well written romance story between Shannon and Frazier. I especially enjoy how Owen helps Frazier with the thought of dating a widow with children. Nice use of a secondary character – it works. Looking to reading the wonderful stories in this set. Thanks! Thanks, Renate! I’m so glad you enjoyed it. I have Falling for You on my kindle and your novella is waiting for me when I get home from work. Thanks for the excerpt – I’m looking forward to curling up with this tonight! Sounds like a good collection. Love the cover of the set. I just ordered it and hopefully can start reading it tonight. Have a great day! Thanks for buying it! I hope you love it as much as all the authors do. Nice post! Thanks for sharing the info! I’ve worked in a grade school and now I’m at a middle school so this book sounds like it’d be fun to read. Wow, he’s a quick mover! This set is up next on my Kindle. Probably starting tomorrow! I have the box set on my Kindle. Your novella sounds like a fun read. Looking forward to reading and enjoying this box set. Thanks, Nancy. I think it’s a great box, but I’m biased. :) I hope you enjoy it! Definitely piques my interest Elizabeth :-) I know this isn’t the same, but I had a crush on my English teacher in my Sophomore year in high school. I was sad to learn that the next year he got his pink slip & ended up moving out of state with his wife and young son. Go, Fraser!!! It’s so sweet that he’s a blusher. Congratulations, Elizabeth! Looks like a great story!